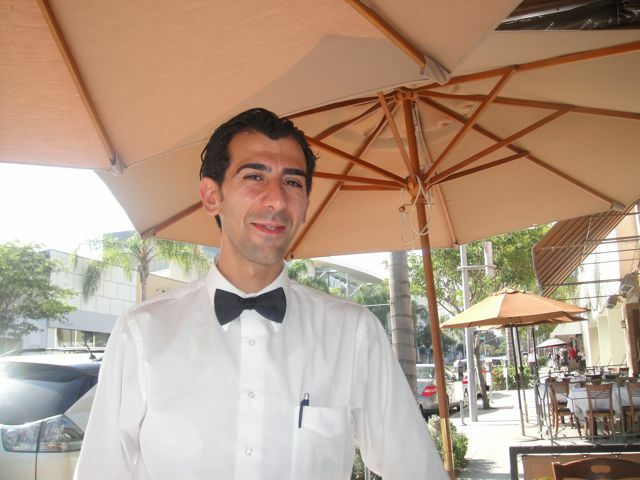 Il Pastaio in Beverly Hills has become more about the scene than the food. It is THE place to sit outside on a lovely Los Angeles afternoon while people watching and being watched. Soft polenta served with morelle and porcini mushrooms and fresh black truffles – this was an indulgence on our part – very pricey at $45 a serving. The polenta was way too loose – more like a thin soup. I think the problem was that it was served immediately – after it sat on the table for a while, it became the proper consistency. 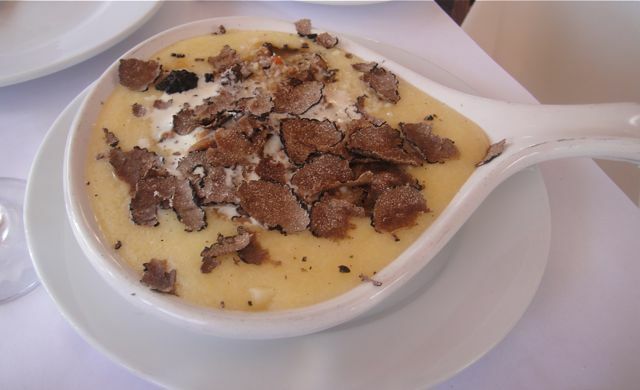 The truffles were not worth the up-charge – not even close to great let alone good truffles. 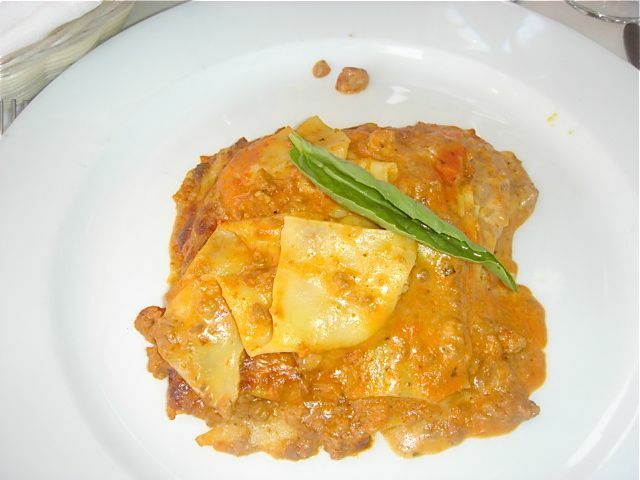 Lasagna Bolognese – Homemade Lasagna pasta served with meat sauce. Where or where was the meat sauce? 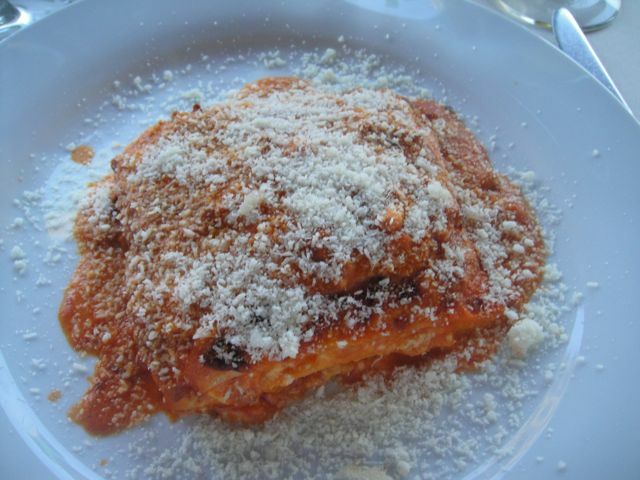 John asked for extra bolognese sauce and was able to create a better version of the lasagna. John also likes a lot of parmesan cheese on top, probably to the horror of many Italians! 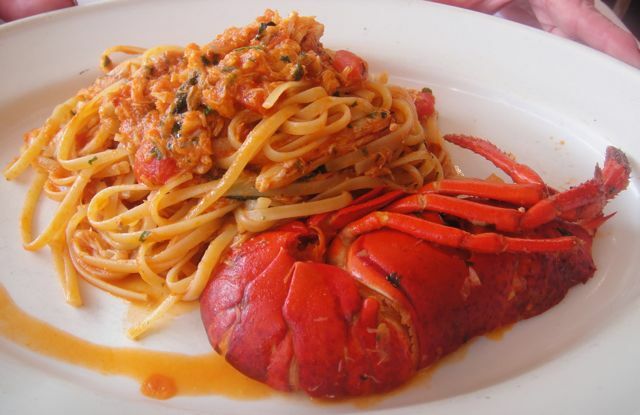 Linguine con Crostacei – Linguine pasta with half lobster and crab meat in a light spicy tomato sauce – good but not even close to the great pasta dishes at Vin Bar/Valentino. 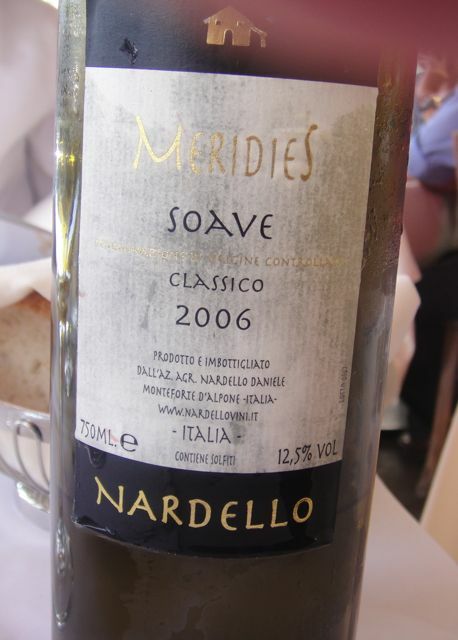 This was a pleasant afternoon but just not great cuisine – I would rather go to Vin Bar or Villetta. We thought a very late lunch or very early Xmas Eve dinner, we would be perfect. At 3:30 Il Pastaio wasn’t a mob scene and lo and behold we got a parking space right in front. We love sitting outside and the weather in Los Angeles was perfect – no rain and sunny, but not hot. 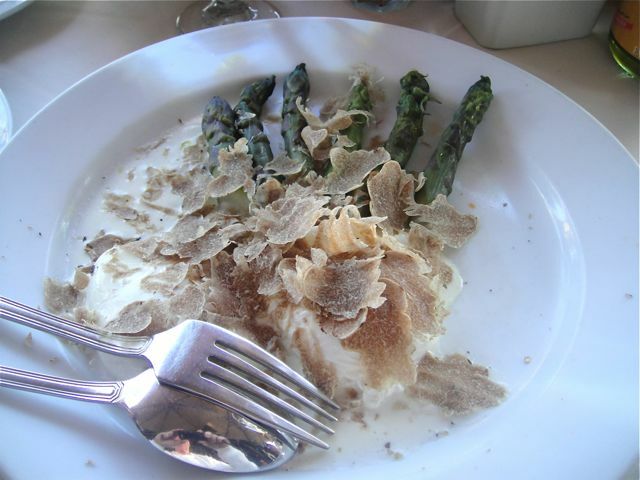 Uovo in Camica con Asparagi – Poached eggs served with asparagus and shaved white truffles – Yes, we were extravagant, but after all this was Christmas Eve. Unfortunately, John didn’t snap a picture of the perfectly runny yolk. There is nothing like a piece of good Italian bread, dipped in runny yolk and topped with some truffles – gives new meaning to a sandwich. 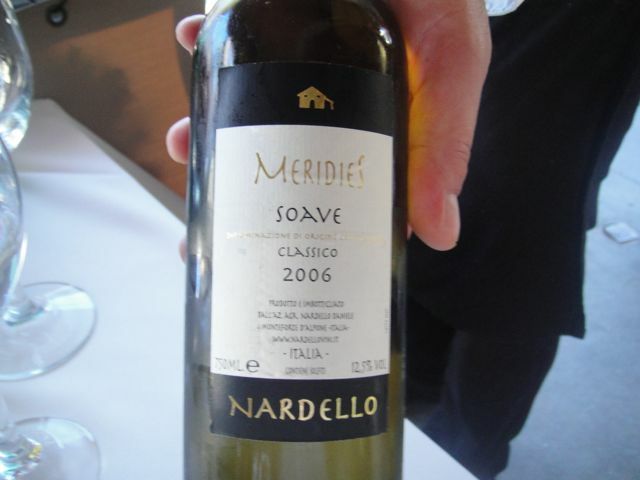 The truffles were good – not the best I have ever had, but certainly adequate. The combination of all the ingredients was terrific. 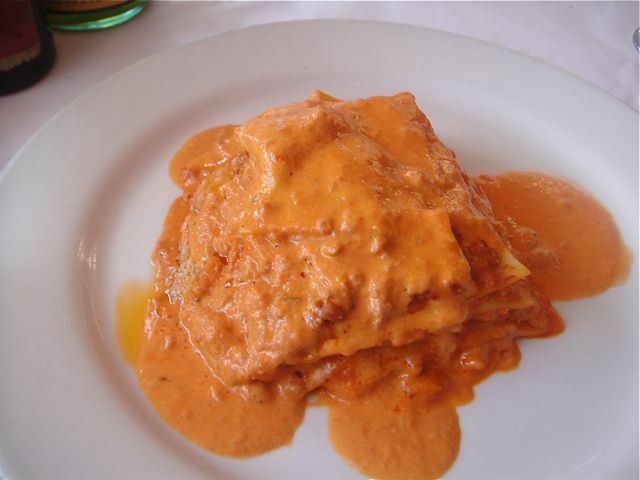 Lasagna alla Bolognese – Homemade Lasagna pasta served with meat sauce. 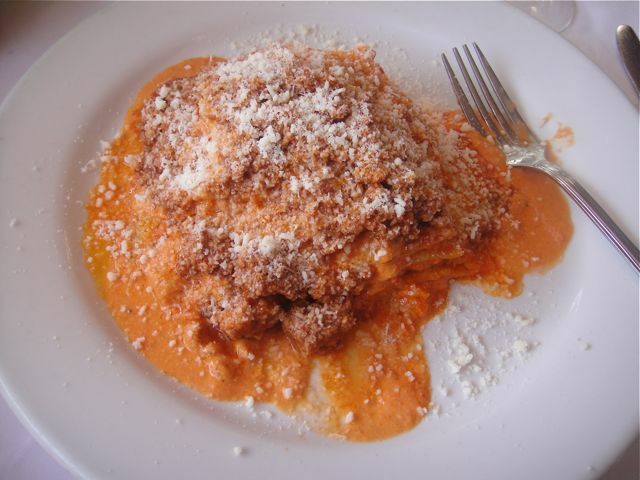 John always orders extra bolognese and must have cheese grated on top. The three men seated at the table next to ours were obviously regulars ( they had a lot of visitors to their table. This is a part of the Il Pastaio scene – everyone seems to know each other.) 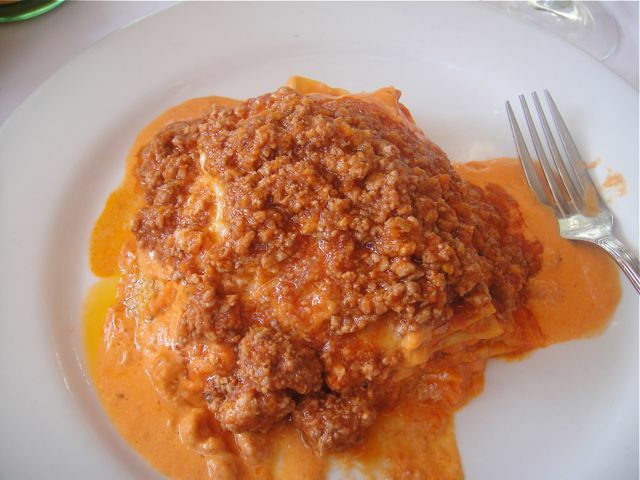 The fact that they were drooling over the lasagna and vowed that this was a must order on their next visit attests to how good the lasagna was. 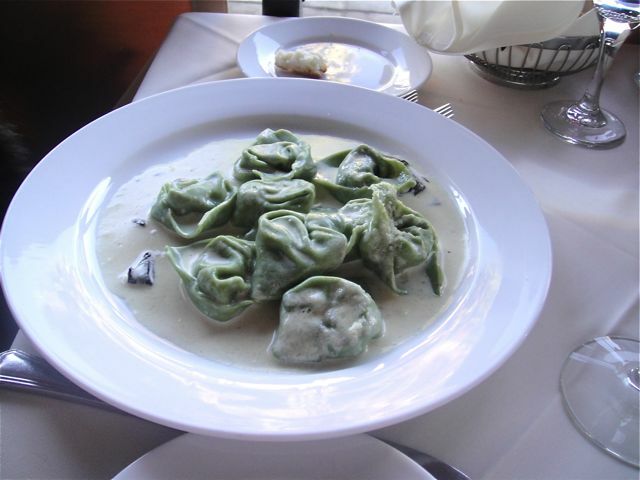 Tortelloni di zucca – Homemade tortelloni stuffed with pumpkin and fresh ricotta cheese with sage and parmesan cream sauce – Il Pastaio excels at pasta – never gluey or overcooked. I love pumpkin stuffed pasta so I was a happy camper. 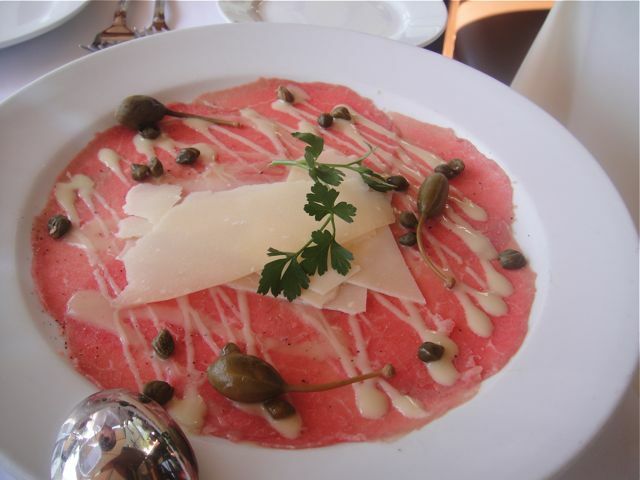 Il Pastaio is a perfect spot for a casual, homey meal. Don’t expect haute cuisine. This is family style dining with well-executed food. Canon Drive in Beverly Hills has become quite a dining scene, particularly at lunch. Since I am there every Saturday for a hair appointment, I have been watching the crowds at Il Pastaio for months. Literally, by 1:30 there are crowds milling on the sidewalk waiting for a table. They only take reservations for 11:30 or 12:00, which is what we did. There were 4 of us for lunch and we had a lovely table outside by the corner of Canon and Brighton Way. 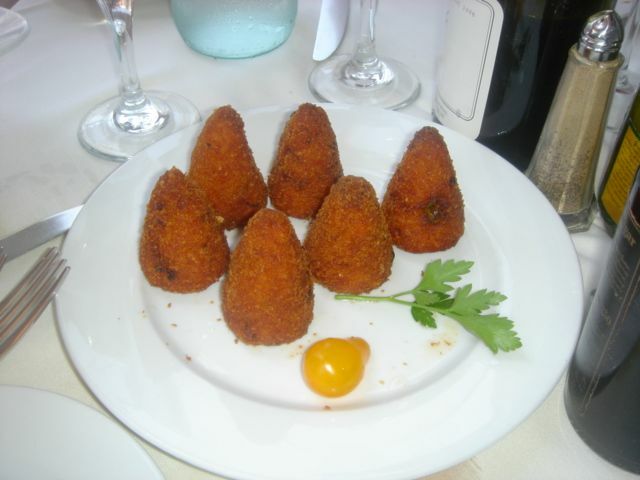 We started with Arancini – breaded rice cones, filled with mozzarella cheese and peas. They were good, but not quite as good as Drago’s in Santa Monica. 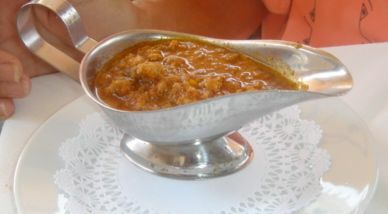 Also, Drago serves each diner an arancini as an amuse for free while Il Pastaio has it on the menu at a cost of $8.95. Although to be fair, there are 6 in an order. I don’t have photos of the next 2 dishes. Cesare – Roamine lettuces, tossed with Caesar dressing, shaved Parmesan cheese and garlic croutons – I didn’t taste this dish, but everything was definitely eaten. 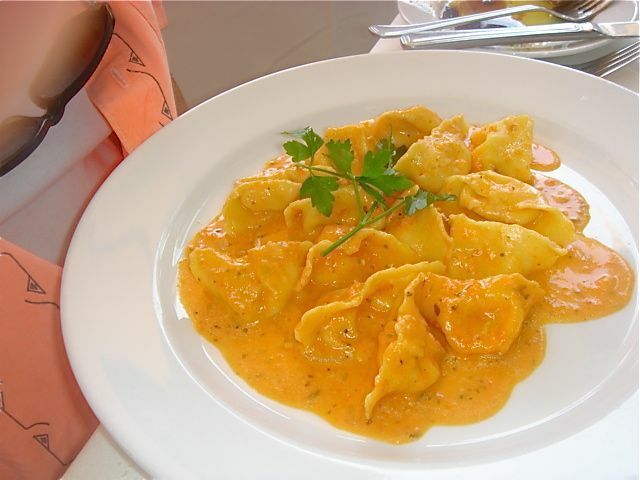 Tortelloni di Mascarpone – Homemade Tortelloni filled with Mascarpone cheese, sun dried tomato and a pink vodka sauce – our friend absolutely adored this dish. My friend and husband ordered the lasagna. John finsihed all of his and then asked for some of my friends. They both defintely loved it. 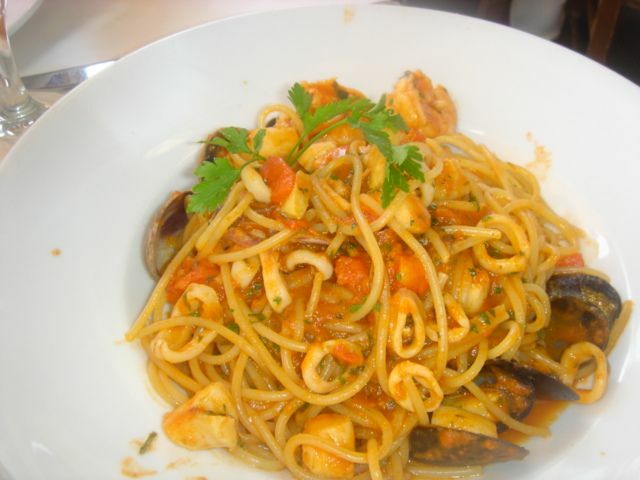 Scoglio – Spaghetti with calamari, scallops, shrimps, mussels and clams in a light spicy tomato sauce – too often in this type of dish, the seafood is overcooked. Not the case at il Pastaio. I can see why there are crowds at this restaurant. It is not cheap, but it is hearty food well-prepared and just fun.